This is food fabric for a Dog quilt. Yes My sweet dog needs his own quilt. He had surgery this week and is doing well but hates the cone. 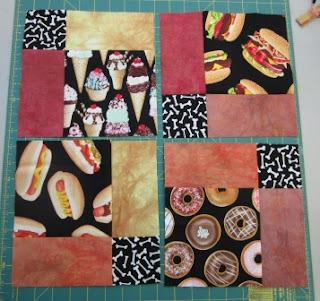 I wanted a quick quilt so I have gone with Disappearing Nine Patch. 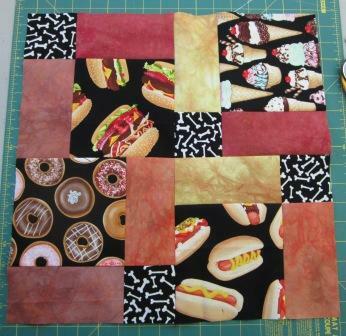 It is also the same fabric I used for my casserole covers from yesterday. If you want a quick quilt this is it. Follow along if you have not made this block before. First I sewed the nine patch blocks together. 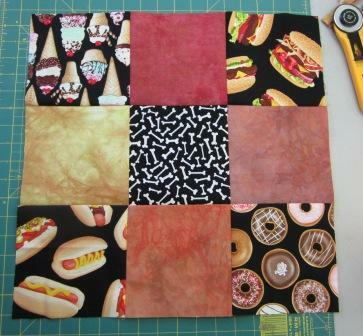 I think I used 6" squares. I know some have used 5 inch square. Just keep them all the same size. Note my black fabric in the middle. Once sewn. Press seams and cut right down the middle. Both up and down and left and right. 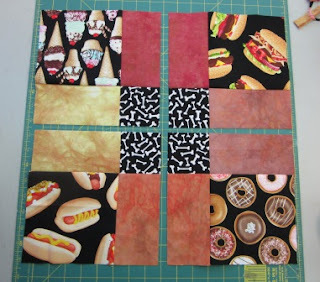 See the black fabric from the middle is cut into four smaller square units. Now the fun part. Give the new units a twist. Turn them. There are a couple of different ways to lay them out now. Play around and see what you like the best. See were you like the little square ( Black Bones in my quilt). Then sew them back together again. You now have a new block. We are spoiling the dog big time. He hates the cone he has to wear and does not do well in his kennel for the night. Wines the whole time, so the first night my husband slept with him on the floor. And I plan to tonight. This way he wears the cone and can not lick but will sleep without the noise.